Consider the reactions that would ensue if world leaders were told that beneath each and every one of their respective countries, there lies multiple explosives, all set to detonate in 12 years’ time. This idea would clearly take precedence within national affairs as not only does it threaten their citizens, but it as well would transform weather patterns and induce severe resource scarcity. Foreign leaders around the world would band together to lead an international effort to immediately disarm the weapons, all mobilized under an allied goal of saving the planet from imminent disaster. Why is it then, that although the United Nations Scientific Panel on Climate Change released their landmark report painting a dire picture of the immediate consequences of climate change, that many world leaders have failed to act? The report made by the Intergovernmental Panel on Climate Change (IPCC) found that if global greenhouse gas emissions continue at their current rate, the atmosphere will heat by as much as 2.7 degrees Fahrenheit by 2040. To prevent this increase, the report states that greenhouse pollution must be reduced by 45 per cent from 2010 levels by 2030, and 100 per cent by 2050. They also explained that by 2050, the use of coal as an energy source would need to drop from the current 40 percent, to between one and seven percent. There is, therefore, no greater national security threat than climate change. Any other threat that may remotely mimic the catastrophic consequences of environmental disaster would be that of nuclear war, and the chances of this happening are much lower than climate change, which is currently underway. Despite the dark reality which seems imminent, there remains reason for hope from the Paris agreement in 2015, which set the goal of limiting global temperature increases below 2 degrees. 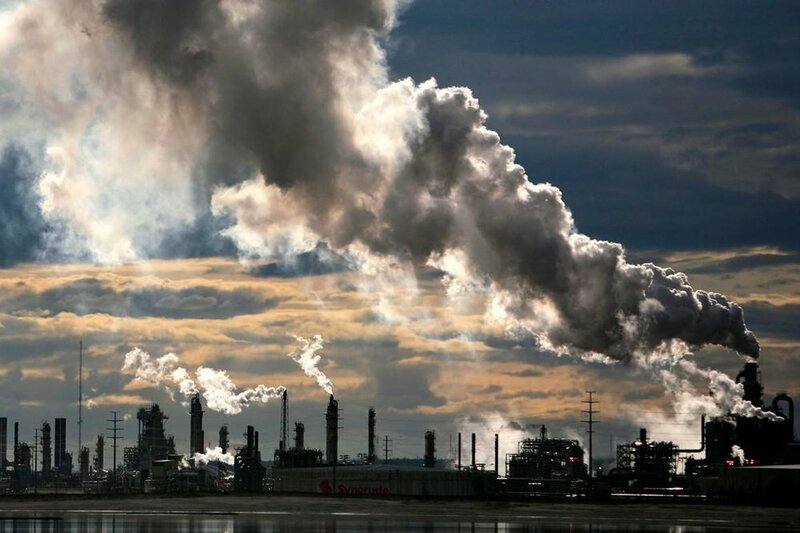 In North America, all eyes lie on the reactions of the United States and Canada, as these two countries remain world leaders in carbon pollutant emissions not only in their own countries, but indirectly through trading partners as well. First and foremost, much spectacle has been placed on the reactions of the United States, especially those of President Donald Trump, as he has been known to mock the science behind human-caused climate change and has vowed to increase the burning of coal. Despite the controversial opinions of the President, the United States delegation joined more than 180 countries in accepting the report’s summary, yet issued a statement claiming that the “acceptance of this report by the panel does not imply endorsement … of the specific findings or underlying contents of the report”. An essential component of the report explained that increasing prices on carbon emissions may be an effective instigator of change, saying that an effective price would have to range from $135 to $5,500 per ton of carbon dioxide pollution. By comparison, the Obama administration estimated that their ideal price would range around $50 per ton, while the Trump administration lowered that figure to about 7$ per ton. This devaluation of carbon emissions from the already too low figure of $50 per ton is in its own right, insulting. It is clear that the Trump administration has no intent to tackle any sort of climate change issue and has instead aimed to discredit the efforts of the Obama administration to the point of a $7 per ton joke. Furthermore, when pressed about the report’s conclusions, Trump chose to cite “scientists” whose opinions he prefers, claiming that “we have scientists that disagree with [human-caused global warming] … You’d have to show me the [mainstream] scientists because they have a very big political agenda”. However, Canadian politicians have followed a different, yet still fairly ineffective path towards mitigation. Previously, Canada stated that they were aiming by 2030 to curb emissions to 30 per cent below where they were in 2005, however, a year ago, Canada told the UN they were 66 million tonnes shy of that goal, despite the policies and programs put in place (66 million tonnes is about what 14.5 million cars emit in a year). Although Canada has at least acknowledged and agreed with the IPCC plan, there is still no immediate plan to increase its ambition, where instead the focus has been placed on continuing the current plans of national carbon prices, eliminating coal-fired power plants, making buildings more energy-efficient, and investing in clean technologies. What is upsetting though are the realities of what Canadian policy makers are claiming, as while they intend to invest in renewable energies, six of Canada’s financial companies are among the top 100 investors in new coal plants, including the Canada Pension Plan Investment Board. On the other hand, although Canada maintains their natural gas projects in British Columbia, environmentalists argue that the export of this gas to China will replace their use of coal, thus overall decreasing emissions. It is, therefore, critical to understand the implications behind the inaction of global leaders. In 2016, North America had held a population of 579 million, where Canada and the United States together had produced 763 million tonnes of coal since 2007 by that same year. Concerning these figures, if environmental disaster remained decoupled from human agency and markets, Canada and the United States would show no issue in providing mitigation efforts. However, as long as economic factors remain coupled and play an essential role in climate change politics, not much will ever be done to prevent this crime against humanity.